In partnership with Indiana Swimming, The Fitter and Faster Swim Tour is coming to Indianapolis for 2 sessions high performance swim clinics. One session will focus on starts and the other session will focus on turns. Participants may attend one or BOTH sessions! These sessions will be led by National Champion Laura Sogar AND Team USA Olympic Coach Todd Schmitz. Coach Schmitz has worked with a number of swimmers from the time they were young age groupers through qualifying for American National teams and Olympic medals including Olympic gold medalists Missy Franklin and Clark Smith. SAVE: Sign up before prices rise! This clinic is designed for swimmers ages 11 and older. Sign up for one or BOTH sessions! The start is your opportunity to cover as much ground as possible in a very short period of time with great efficiency and momentum heading into your streamline and underwater kicking. There are countless intricacies to performing a start and you only get better with practice. Olympic coach Todd Schmitz and National Champion Laura Sogar will share his strategies for learning and executing this athletic skill. 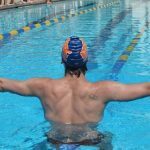 STARTS: How you set up on the block including proper hand and foot placement can allow your swimmer to explode forward with a lot of explosive power. Coach Todd will work with each swimmer to find their best position on the block as well as how to launch their body forward into a tight streamline and enter through a small hole. Backstroke Starts: This challenging and athletic skills takes a lot of practice to perfect. Accelerate the learning curve by learning drills and exercises from Olympic coach Todd Schmitz! He will start by making sure that your swimmer sets up on the block properly so that they can explode away from the wall. Then they'll practice throwing their heads and arms back while arching their backs and getting their hips over the water for a clean entry. You won't believe the improvements you'll see! Goal Setting: One of the most common, and simplest, strategies individuals in any challenging situation use is learning how to set and go after their goals. There are lots of steps to successful goal setting but the key is OWNING your goal! Your swimmer should "drive their own car" and take charge of pursuing higher goals. 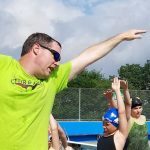 Coach Todd will help your swimmer set up the simple steps of goal setting and how to take personal responsibility for the successes and failures they'll face along the way. Most age group swimmers add in extra movements on their open and flip turns that slow them down and prevent them from carrying their momentum through the turn! Even at Olympic Trials we see many very fast swimmers who miss making finals and even the Olympic team because of their turns! The turn is an opportunity for a swimmer to actually GAIN MOMENTUM, when in fact most swimmers actually slow down. At both of these sessions, Olympic Coach Todd Schmitz, will teach your swimmer how to improve their turns so that they can drop time! FLIP TURNS: Your swimmer will learn how to carry their momentum through the turn to get in and out of every wall faster. Swimmers will practice accelerating into the wall with long strokes and then using their core and arms to get through the turn. They'll practice planting their feet on the wall for a powerful pushoff in the perfect streamline. Coach Todd will give the swimmers drills and exercises to help them master this athletic skill now as well as in the future! Participants will take their strokes to top speed and get their heartrate up with a set from Laura Sogar and Todd Schmitz. They will get to work on holding on their form while also getting their heartrate up to put their new skills to the test of fatigue. Take a photo with Laura Sogar and Coach Todd, get autographs, and receive a special gift from our sponsors!